Today I have up the set of swap blocks that are finished. I am working on my second set...I'm going to use the Clay's Choice block for my second set. I set aside the Queen's Jewel block for now. There is no date set for The Peanut wedding to This Guy, so there is no hurry on the quilt (and I'm still collecting fabrics). What is on your design wall? Check out more design walls at Patchwork Times. 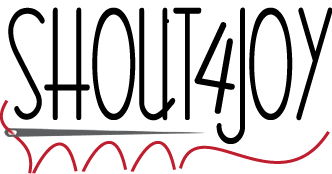 I hope you get a chance to quilt today to celebrate! I'm hoping to sneak down to the dungeon and get a bit of quality time with my machines. 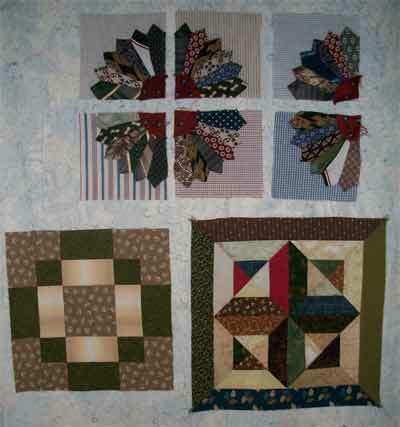 Or even just get some blocks cut out for the swap I'm participating in. I finished up the Antique Tile blocks and am still waffling on what to do for my second block. Sorry for no picture, for some reason it won't let me upload anything today. Here is my design wall for March 14. The six Father's Day ties blocks, a swap block and the first block for The Peanut's eventual wedding quilt. What is on your design wall? Check out other design walls at Patchwork Times. Last week, the Boybarian loaded his quilt on the frame. This week I had his start quilting. He is a speed demon with his quilting and had HUGE toe catching stitches. 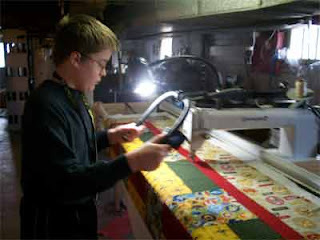 He has already unsewn two rows...so he has one row quilted and mom has learned that 12 year old boys like speed (rather, this fact was emphasized!). I'm hoping we can slow him down for the next rows so that he doesn't have to spend much more time unsewing his quilting stitches (since *I* get roped in to help!). 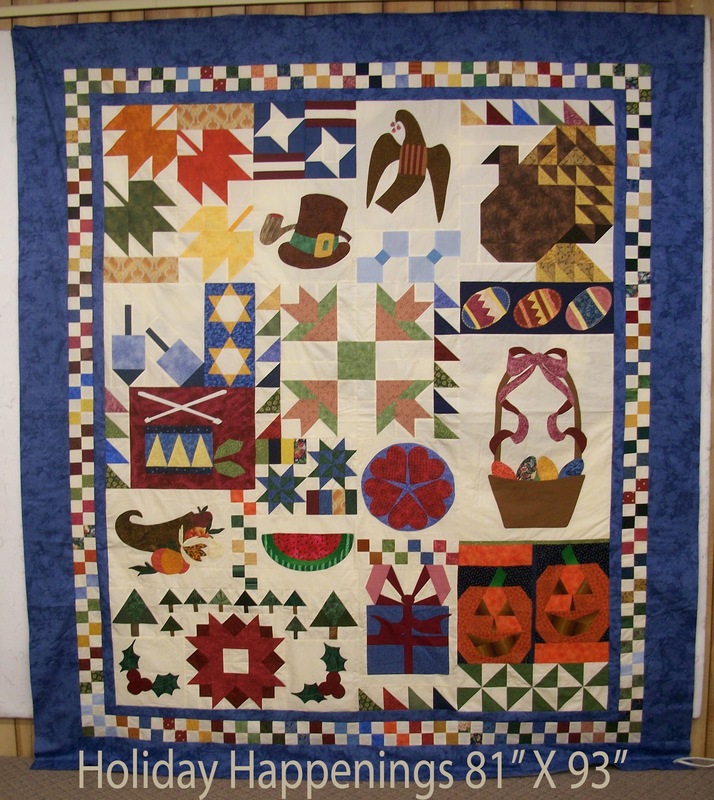 This is our guild's raffle quilt for the year. It will be in the quilter's hands very soon but I wanted to be able to see it, so we hung it up at the LQS. 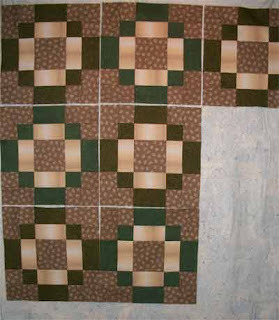 After the guild members chose the theme and basic type of quilt, I designed this in EQ7. 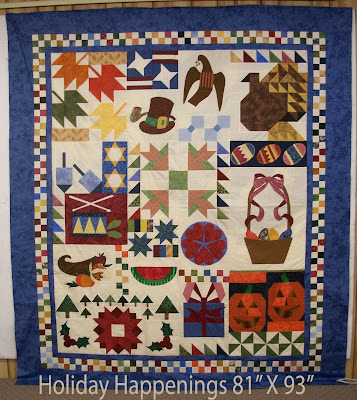 I think the Country Charms Quilt Guild did a great job - this is a fun quilt! We started off with a small piece of a fabric to give us color inspiration for our blocks...it is the floral seen in the dark egg in the basket. 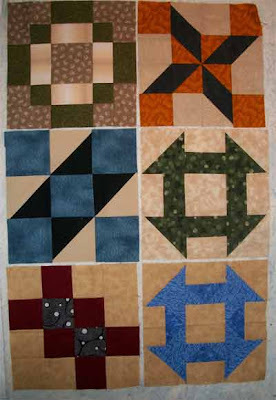 Everyone used the same background fabric and then we raided our stashes to make up the blocks. For more design wall inspiration (I sure do get inspired!) check out Patchwork Times.